We are getting our Halloween on. 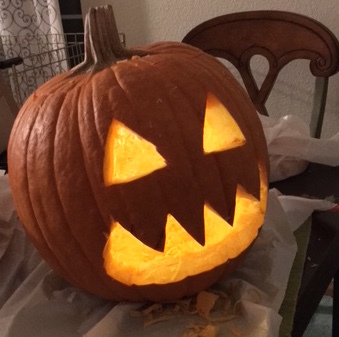 Carved our pumpkin last night (it has been years since we carved a pumpkin) and I don’t think he turned out too badly. I can’t believe it, tomorrow is Halloween and then October is over and November will be here followed by Christmas. It is still pretty warm here in California so I am not quite sure yet when I will be able to wear my new Hell Bunny Shonna coat or even my Pearl coat from Collecitif. The mornings start out chilly but the heats up to 80 degrees. It is Fall and the vineyards are changing colors and leaves are falling from the vines. Soon they will be sticks. I’m working on some exciting projects regarding my pinup modeling and just received confirmation that a international publication will feature me…. more to come so please stay tuned. I am working on some talks as my goal is to take all this newly found attention and do something positive with it so I am committed to encouraging and motivation women and the youth of today. In 2016 I will secure some speaking opportunities and really try to take my positive message to the masses. Again, stay tuned for more on this chapter!! Hubby and I are working on a new look and feel for my website. It has been steal years with the current theme and I think it is time for a change so maybe this weekend the new look will make its debut. Hope your Halloween is safe and fun!! I’d love to hear from you, drop me a line via the contact me button.